70mm X 198mm Abranet abrasive strips for dust free sanding when used with an extract sanding system. Long working life compared to non mesh based sanding strips. Can also be used with all hook and loop sanding blocks. Abranet Mesh Abrasive 70 X 198 There are 6 products. Mirka Abranet 70mm x 198mm Sanding Strips P80 Each box contaiing 50 strips. Mirka Abranet 70mm x 198mm Sanding Strips P120 Each box contaiing 50 strips. Mirka Abranet 70mm x 198mm Sanding Strips P180 Each box contaiing 50 strips. 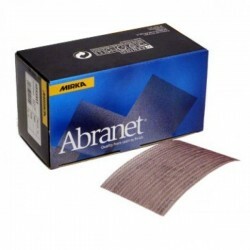 Mirka Abranet 70mm x 198mm Sanding Strips P240 Each box contaiing 50 strips. Mirka Abranet 70mm x 198mm Sanding Strips P320 Each box contaiing 50 strips. Mirka Abranet 70mm x 198mm Sanding Strips P500 Each box contaiing 50 strips.